2. Pulled up the chords to a song I had stuck in my head all day. 3. Tried to play said song. 5. Changed into my customary at-home getup (oversized t-shirt, no pants). 6. Realized my roommate was coming home and put on pants. 7. Ate an embarrassing amount of off-brand Fig Newtons. 8. Exchanged 10-15 public Twitter messages with fan-of-the-blog Andrew Woods, who I swear has seen every movie ever made by anyone ever. This was all in an attempt to stave off the boredom that I, uncultured sonofabitch that I am, felt washing over me as I watched Floating Weeds. I've sat through some pretty slow movies; hell, I managed to make it through Barry Lyndon with only a short nap midway through. But it took just about all my strength to make it through this one. Floating Weeds follows a troupe of cut-rate Kabuki actors as they perform for mostly empty auditoriums in a seaside town on the Inland Sea in Japan. We only see brief snippets of the performances, and they're pretty rank; the layers of thick makeup can't hide that these actors look tired and uninspired. They come alive offstage, though, as they travel around the town looking for cute girls and drowning their boredom in bottle after bottle of sake. Only owner/lead actor Komajuro (Ganjiro Nakamura) seems at all enlivened by the job. He has to keep the horny middle-aged dudes, giggling Japanese schoolgirl stereotypes, and jealous shrews that comprise the crew happy and mostly out of trouble. The last of those is personified by Sumiko (Rashomon's Machiko Kyō), Komajuro's mistress. Her jealousy seems to be the price Komajuro must pay for having a pretty woman at least twenty years his junior at his beck and call. "Screaming Infidelities" was odd but effective. The target of Sumiko's ire this time is Komajuro's former mistress, a woman nearer to his age who owns a small restaurant in the town. Oyoshi (Haruko Sugimura) may not have Sumiko's looks, but she makes up for it by radiating inner calm and sweetness. It turns out that the troupe's visit to the town is no coincidence - Oyoshi has a handsome teenage son named Kiyoshi (Hiroshi Kawaguchi) who calls Komajuro "uncle." Surprise surprise, Kiyoshi's his kid. Komajuro's not deadbeat dad, though. Instead of allowing his son to find out that he's a crappy itinerant actor, Komajuro let Oyoshi tell their son that his father had died and provided for the family by sending part of his paycheck every month. I had a hard time parsing this through a Western lens at first. "Don't abandon your son, assface," was my first thought. Miss your kid growing up just because you don't want him to know you're a crappy actor? Please. 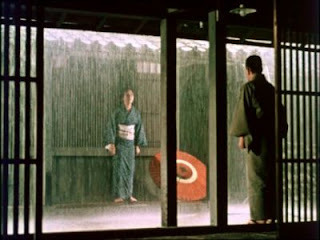 But as the film wore on, I came to sympathize with Komajuro's decision. It's not the one I would have made, but I didn't grow up in early 20th-century Japan. Above all else, I stopped expecting the film's characters to be petty, callow, or angst-ridden. The people of Floating Weeds are, for the most part, docile, polite, and hard-working. Ozu himself seems to take after them more than the film's few roustabouts. His film is so restrained it's almost, well, boring. There's only one point that the camera moves in Floating Weeds, and it happens to be the only instance of camera movement in all of Ozu's color films. Calling the film "unhurried," therefore, would be something of an understatement. It resembles, more than anything else, a series of immaculately-composed watercolor paintings. It's refreshingly serene. And that serenity makes the scenes of emotional trauma all the more arresting. Sumiko confronts Komajuro's old girlfriend, setting in motion a chain of events that will lead to Kiyoshi discovering that his father's not dead after all. In between, Kiyoshi falls in love with a young actress named Kayo (the beautiful Ayako Wakao), even though Kayo originally only approached the young man because Sumiko paid her to. There's not a whole lot more to the film than that. But in its gentleness and sincere regard for the dignity of its subjects, Floating Weeds is a treasure, and certainly something I'm glad I made it through.